The PLUS Coalition is an international non-profit organization with a tightly focused mission: to simplify and facilitate the communication and management of image rights. Organized by respected associations, leading companies, standards bodies, scholars and industry experts, the PLUS Coalition is operated by and for all communities involved in creating, distributing, using and preserving images. Spanning more than seventy countries, these diverse stakeholders have collaborated to develop both the PLUS Registry and a system of industry standards that together make it easier to communicate, understand and manage images. The PLUS Coalition exists at the crossroads between technology, commerce, the arts, preservation and education. More Info. See all news items at the LATEST NEWS PAGE. Get Your Free Listing in the PLUS Registry! The non-profit PLUS Registry is a global online resource that provides instant identification of image creators, image rights holders, images and related image rights information. 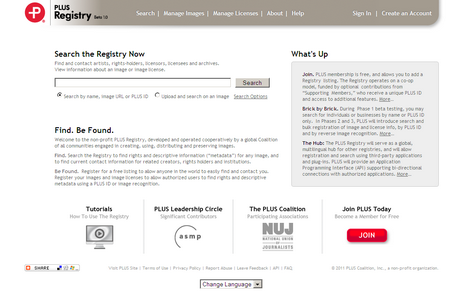 Visit the PLUS Registry Beta site now at www.PLUSregistry.org. PLUS Registry Browser Lookup of PLUS IDs The PLUS Registry allows for lookups of PLUS IDs written in URL format, such as http://plus-id.org/[your ID here]. To register and to reserve your PLUS ID and custom PLUS IDs, visit the Registry at www.PLUSregistry.org. Selling Stock. A founding PLUS Coalition member, Selling Stock is the leading publication on the business of stock photography, with breaking industry news, opinions and advice. Subscribe. PLUS in the US Copyright Office Report. The US Register of Copyrights repeatedly references the successes of the PLUS Coalition in her report "Orphan Works and Mass Digitization." Read the report. Amazon Web Services Supports PLUS with a significant grant of technology services. Amazon is a supporter of the PLUS Coalition and PLUS Registry. UserVoice Supports PLUS, providing UserVoice Feedback and Helpdesk for the PLUS Registry. UserVoice is the most effective way for software companies and web app developers to incorporate feedback tools into their product websites, extending feedback channels to give users an easy way to voice their thoughts on new features, roadmaps, etc. More. "Like" the PLUS Facebook Page. The authoritative desktop reference volume for everyone engaged in creating, distributing, using or preserving images. This site is best viewed using the latest versions of Safari for Macintosh and Internet Explorer or Firefox for PC.